Should a student transfer to another school using the A.C.E. curiculum and program, make certain the student’s Permanent/Academic Record is updated and complete, and is professional in appearance. Send COPY of the Permanent/ Academic Record (Form #324). 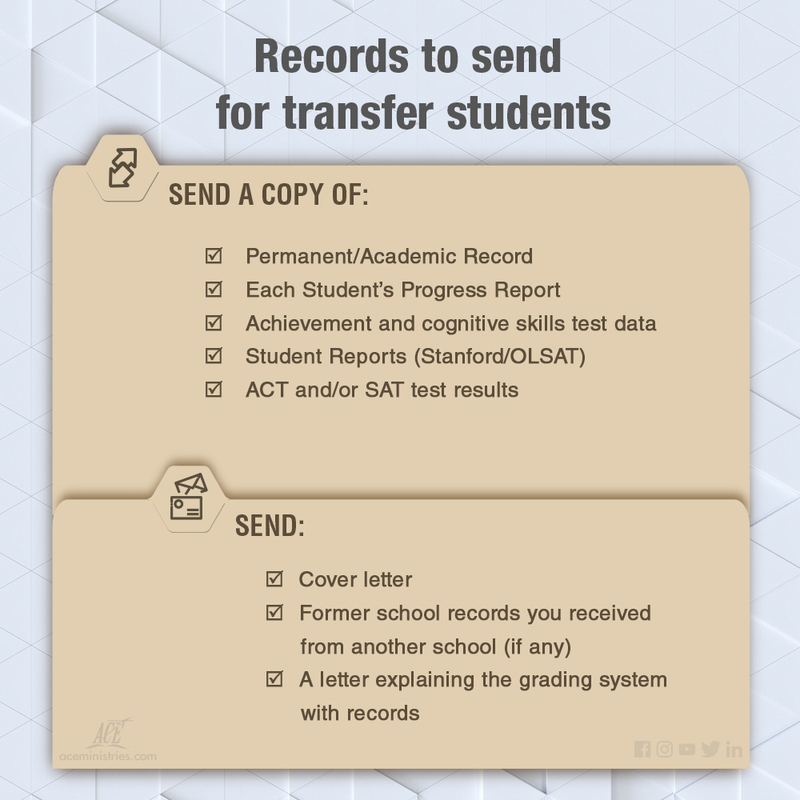 Copies of Permanent Records of graduates may also be released to designated colleges or prospective employers upon receipt of a letter from the graduate or his parents. Do Not send the originals of the Permanent/Academic Records. You need to maintain them permanently. Send copies only. Send COPY of each Student Progress Report as a backup to the Permanent/Academic Record. Send COPY of achievement and cognitive skills test data and Student Reports (Stanford/OLSAT). Send COPY of ACT and/or SAT test results. Send former school records you received from another school (if any) when the student enrolled in your school. Do Not send Discipline Records. Send a letter explaining the grading system with records. Some states require parents to submit a written request to release academic records to specified educational institutions. Where this is needed, give a copy of form #327 Student Record Release to parents. Then, the parents give the copy to the receiving school to complete and send to you as an official request for releasing student records.